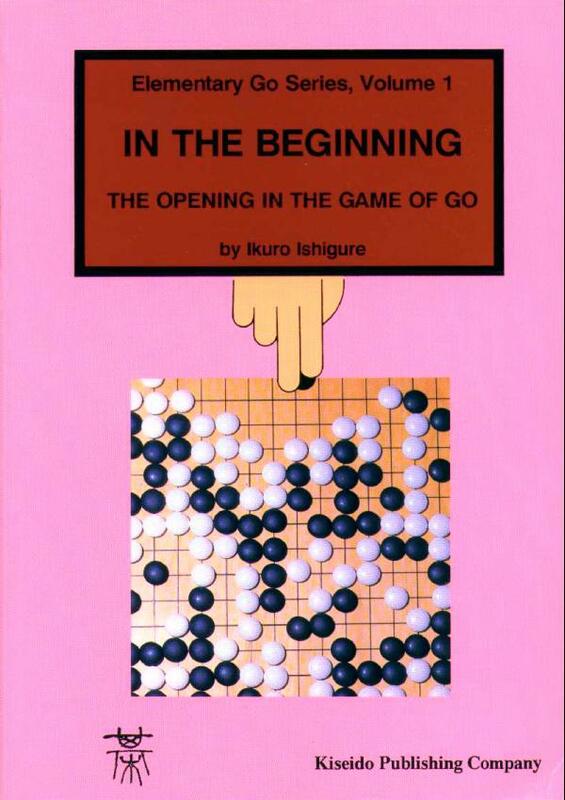 In the Beginning , by Ishigure Ikuro. Volume 1 of the Elementary Go Series. Ishi G10/Kiseido K10; 1973. The first thing that you should know about this book is that it's not a general introduction to go, so if you're looking for that, don't buy this. The word beginning in the title refers to the fact that this is, rather, a book about the opening. The first chapter introduces the basic kinds of moves played during the opening (e.g. what it means to play on the 3-4 point or the 3-3 point, extensions, pincers, invasions, etc.) The second chapter is about higher-level concepts like thickness. The third chapter consists of ten problems. It's a good book, but rather austere for an introductory book on the opening. The first chapter does a good job of introducing you to the various kinds of moves that you might want to make, so if you're paralysed with the emptiness of the board at the beginning, this book might help you there. I found the second chapter to be less helpful when I first encountered the book, though: I would have preferred tips on a much more basic level. On the other hand, the concepts in that chapter are hard ones to explain and put into practice, so I don't blame this book too much for that. You shouldn't expect to be able to solve the problems in the third chapter after you've read the first two chapters. For beginners, Otake's Opening Theory Made Easy might be a better place to start; it's certainly easier reading, and less scary as an introduction to the opening. But I don't want to discourage people from reading this book fairly early on, either - it is a good book, especially if you resign yourself to the fact that it will take several readings for many of the concepts to sink in. Addendum: I recently reread it as a 2kyu, and I think I got a lot more out of it this time. The second chapter talks about concepts that I thought that I was familiar with, but I was continually surprised by the examples in the chapter, since I would usually have played somewhere else! (This is in contrast to when I first read the book, where I had no strong feelings of my own about where to play, so I just nodded at the examples and thought that they seemed sensible.) So this book certainly stands up to rereading. Also, when working through the problems in chapter three of the book, take your time with them. There's only ten of them, so you might as well try to do, say, one a day, and really think about it. Also, the book doesn't just give one correct move, but also several reasonably good moves of varying quality; so instead of just looking for the solution, spend your time thinking about where you would play in each section of the board if you were to play there next, and then which of those plays ultimately looks best. And then put the problem aside, and come back to it a couple of hours (or a day) later, and see if you notice anything new. And then you can look at the answer. This was the first non-introductory book I read. I was and am very keen on it and I think it is actually quite good for the 20kyu player. Although I also like the Otake book, I feel that In the Beginning has more unity and coherence to it.